Every year, my mother-in-law, sister-in-laws, and myself have a cookie-baking extravaganza. We have a few family-favorite recipes that we make every year, but we are always trying new things. This year, my mother-in-law saw a page in the LA Times that listed the Top Ten Cookie Recipes that were tested and tried in the LA Times test kitchen. Naturally, we had to give them a go. We ended up making about 15 different cookie recipes (I told you it was an extravaganza), and my favorite one was the Cherry Pistachio Rugelach. There are so many savory flavors in this cookie that it hardly makes you feel guilty for indulging, but rather extremely satisfied. 1. In the bowl of a stand mixer fitted with a paddle attachment, or in a large bowl using an electric mixer, cream together the cream cheese and butter. 2. Add the sugar, salt and vanilla, and beat well. 3. Add the flour, and mix until just combined. Remove the dough to a well-floured surface and roll into a ball. 4. Cut the ball into quarters and wrap each piece in plastic wrap. Refrigerate to firm up the dough, at least 30 minutes (or freeze at least 15 minutes). 2. In a small bowl, combine the brown and granulated sugars, cinnamon, nutmeg and pistachios. In another small bowl, stir together the preserves and orange zest. 4. 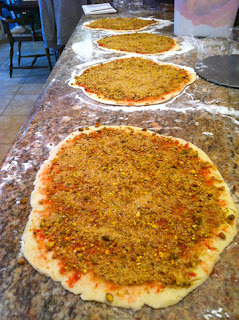 Spread 2 tablespoons of the preserves in a thin layer over the dough, then sprinkle one-fourth cup of the pistachio mixture over the preserves, lightly pressing it into the preserves. 5. Using a sharp knife or pizza cutter, cut the circle into 8 wedges. Roll each wedge into a crescent shape, rolling from the outside in toward the point. 6. Place the rugelach on a parchment-lined cookie sheet, point-side down, spaced an inch or two apart. Brush with egg wash. Sprinkle each with a bit of cinnamon sugar.